Today was Day #7 of Chocolate and Honey Theme Week, and Day #1 of Chocolate and Mint Theme Week. Mint and dark chocolate is a classic combination. Done right, this pairing is wonderful, refreshing and sophisticated. This (seasonal) Mint Bar from Bees and Beans (Portland, OR) was done right. It contained a great blend of fresh flavors -- a 70% dark chocolate shell enveloped a creamy, honey-kissed, natural tasting mint fondant center. 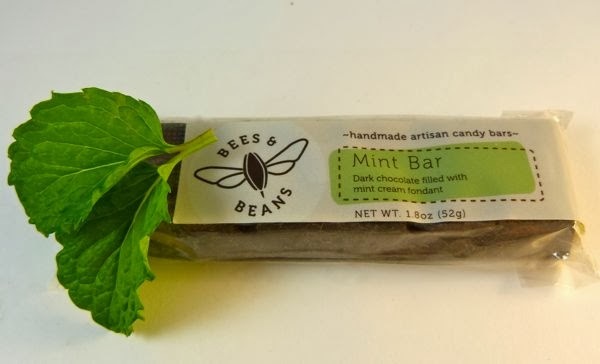 Bees and Beans founder Faith Dionne has made a line of small-batch artisan candy bars that incorporate fresh, local ingredients from Oregon (honey, mint, filberts, raspberries, etc.). I also look forward to trying Dionne's dark chocolate covered "Honey Bar" with honey caramel, salted filbert and "honey nougat and a sprinkling of sea salt" in the future.